ADVENTURE is...Jumping Off a Cliff...Out West. 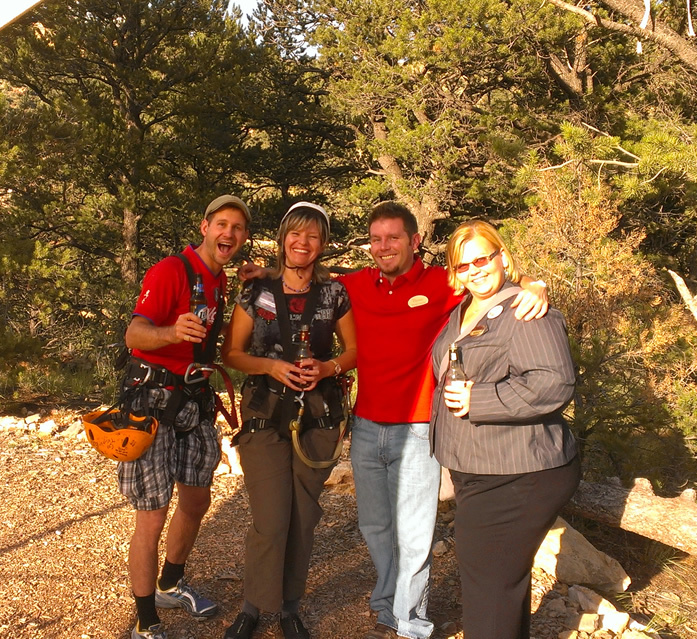 Join us in Manitou Springs for the Best Hour of Adrenaline in Colo-Rad! All natural terrain free style course. 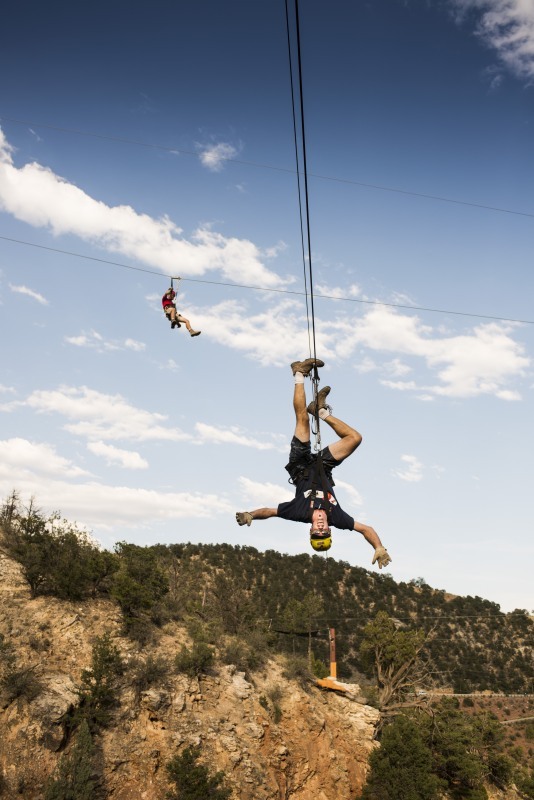 The Best Hour of Adrenaline in Colorado! Your adventure startsd in the heart of Manitou Springs at our Convenient location in Manitou Springs. Check in at our Cabin is 15 minutes prior to your tour time. Out staff will fit you with a full body harness and helmet and prepare you for launch. A short trip up the 4 x 4 hill in our custom vehicle will bring you to the Zipline Course. 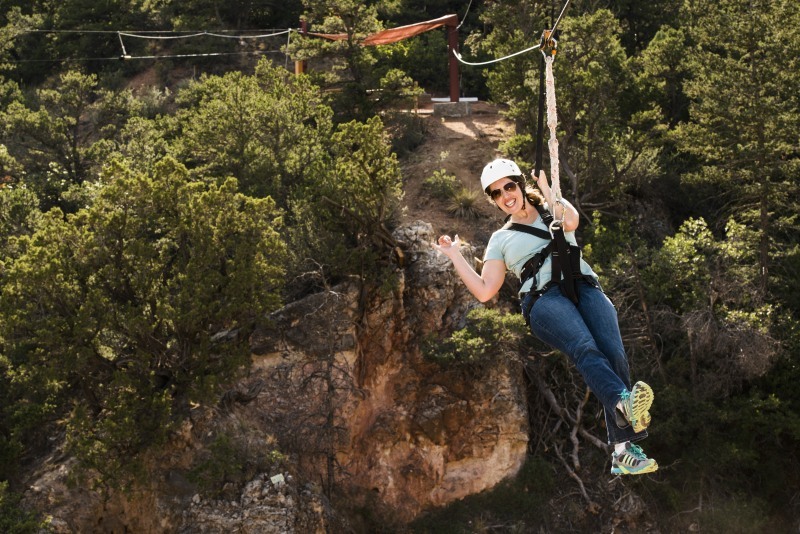 Our course includes 5 extremely fun ziplines! 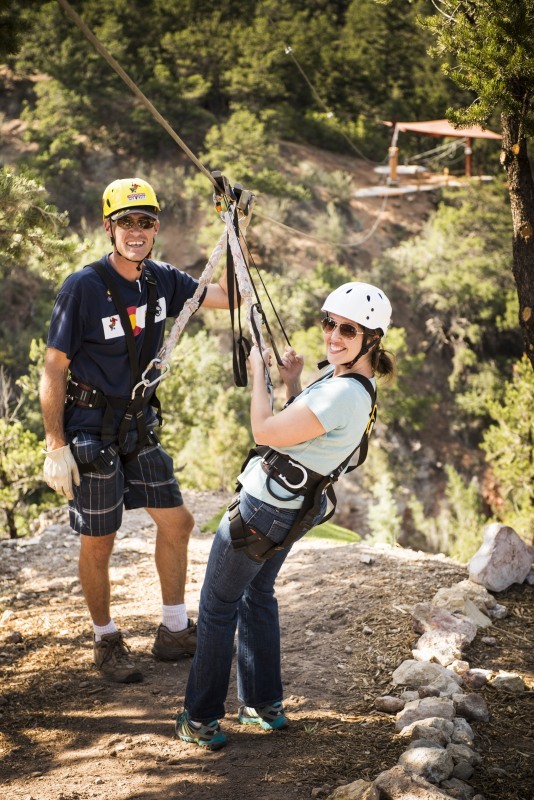 Your guides will provide a safety briefing and then its time to ZIP ON! Run Jump or Crawl and then let your spirit soar! Our guides do all the braking so you can enjoy the ride. For those who want to pull the trigger and launch more fun. SO you’re ready for the next level? Have you ziplined before? Perhaps you’re just a bit more adventurous than your neighbor? Well you’ve found your tour. 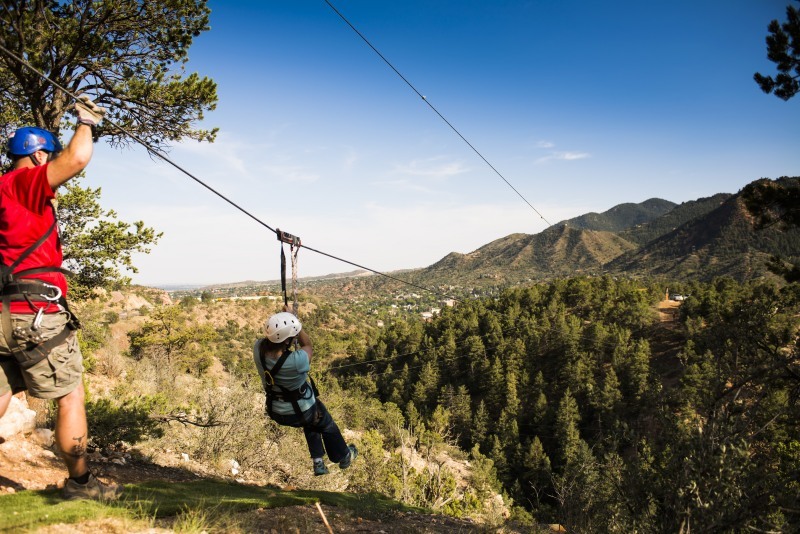 At Pikes Peak Ziplines you can be a, “guide in training” for the day….get bragging rights and take home a cool souvenir. The Hook-up Tour puts you on the throttle of your adventure. 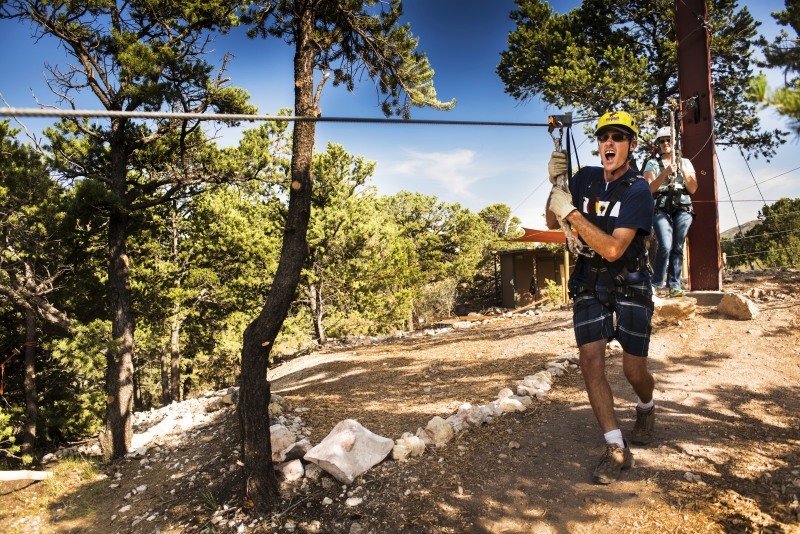 This exclusive tour teaches you the ropes and lets you, “Hook-up” to the Zipline cable yourself! WHAT? That’s right and only at AOW…but you won’t be left alone. Our guide will accompany your group to ensure you are properly taken care of. But he or she won’t be on the launch pad with you to double check your Hook-up. You and your teammates will be responsible for ensuring each team member is properly attached and ready for flight! This tour is not for fools. If you fail to hook up correctly and just run off the cliff. You probably wont die but its gonna hurt real bad. This is real life experience with consequences and you will sign a waiver stating so. We recommend this adventure for those who are comfortable assuming the roll of “Trainee” for the tour. In the event you freak out we will Hook you on but you will get a different type of souvenir at the end:) No previous experience is necessary, just a brave heart. 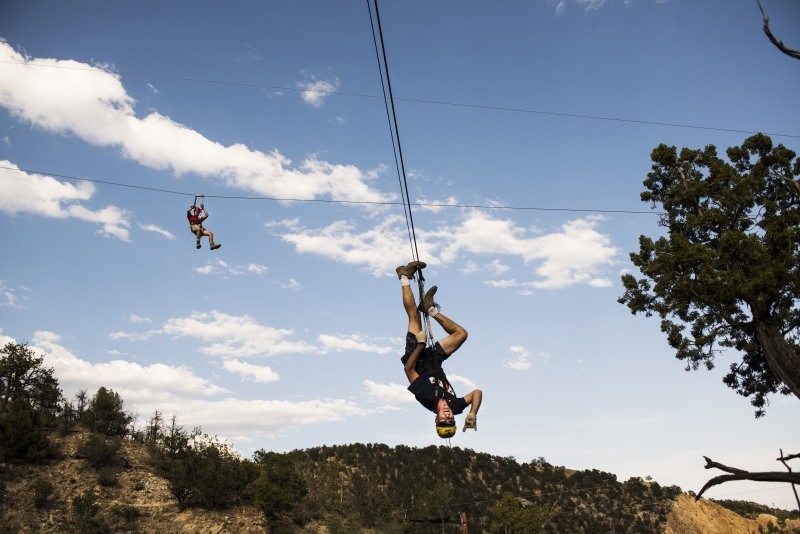 The modified course includes our Longest and fastest Zipline. These two lines provide plenty of opportunity to learn some tricks, soar over the canyon and experience ziplining at a great rate. Each guest will get multiple zips through out the evening. 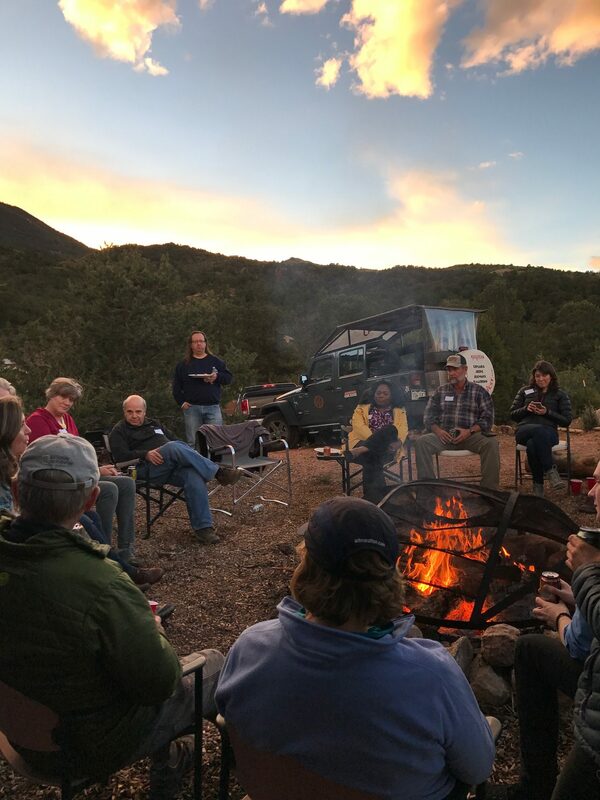 After Ziping hang out around the giant fire pit, watch the sunset and roast s’mores with your family for the ultimate Colorado experience. Family Night was the perfect end to our Colorado Adventure! AOW has been Making America Great Again for years! Show your pride by flying the Red White and Blue. 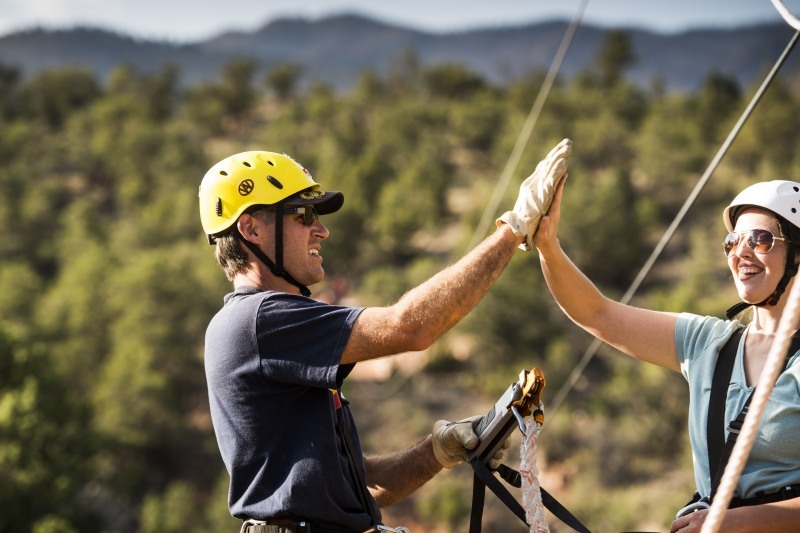 Start your 4th off with some American Adrenalin at Pikes Peak Ziplines. 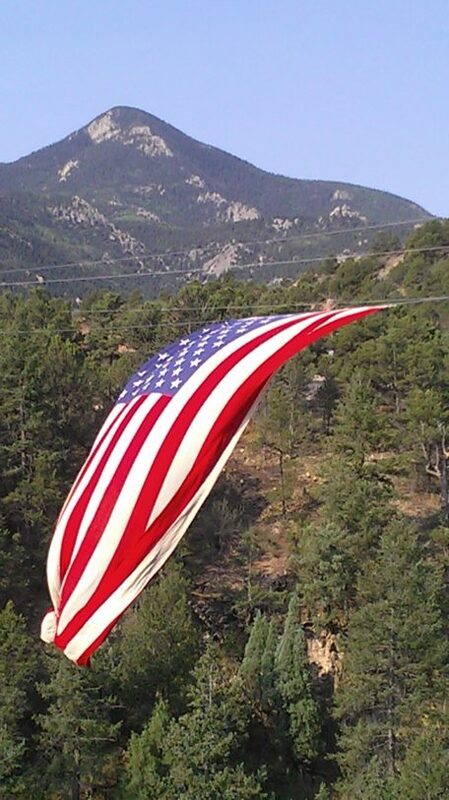 AOW has the biggest American Flags in town and they will be on display over the Canyon and easily visible from Hwy 24. 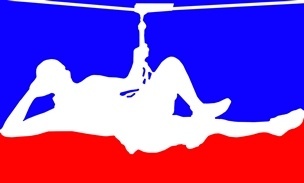 Each guest recieves a T-shirt and Flag to soar with on the Zipline Course. This is a popular activity and usually sells out so book early for this fun adventure. Best 4th of July ever! Youth Groups, Adult Group, Team Building and Parties! 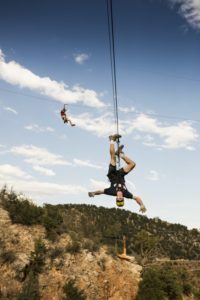 Pikes Peak Ziplines is an event facility like no otherBring your friends, family and co workers to the Ziplines for an adventure they will never forget. Your team will have the whole course to themselves including use of the Fire Pit and Tented pic-nic area. This Colorado outdoor fun in a beautiful setting. Our facility can handle up to 70 guests at a time. Larger groups will be accomodated by ziplining in shifts. 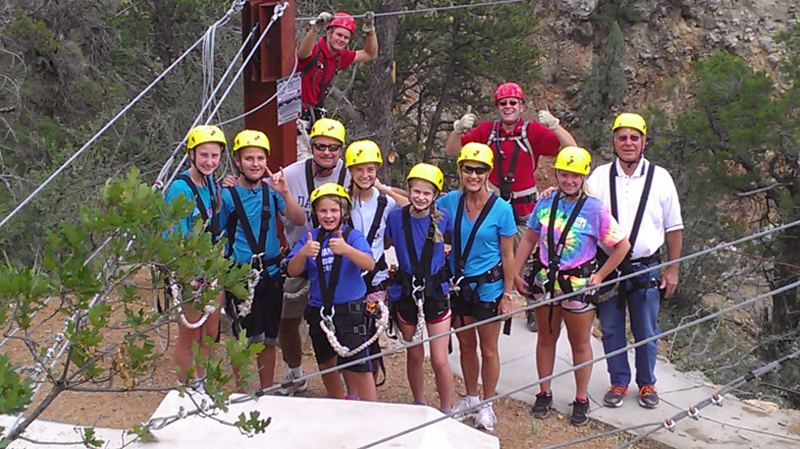 We have plenty of room for you at Pikes Peak Ziplines. Call to book your custom tour. Our team had a blast and bonded together. Can’t wait to come back. 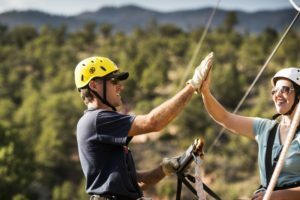 Raise money for your cause at Pikes Peak Ziplines. 100% of the proceeds raised goes back to your group. That’s right, all of it. AOW is the premiere provider of Adventures in the Pikes Peak Region and we want to share that opportunity with you. There is only one catch, you must raise $1000.00. Call AOW for details on this fantastic opportunity and to see if your group qualifies. Tour– It’s the family night package run on Friday evenings. No s’mores. Payment- $1000.00 minimum Your group needs to raise at least $1000. For example, your group plans an event and charges $50.00 per person. Your group would need to have at least 20 people to reach the $1000.00 threshold. Or perhaps your group charges $100 a person and you bring 30 people. You would raise $3000.00. Your group Pays AOW by check and AOW will write a check back. This way we can keep track of how much we have raised together. Qualifying Groups- Groups need to submit an application. Name, Cause, Contact info, Date requested, Non Profit status, Web site or other needs. Applications will be submitted to AOW management for consideration based on private company policy. Best Hour of Adrenaline on the Front Range of Colorado! This is a natural terrain Zipline course utilizing cliffs and steep wooded forest for launch and landing zones (No artificial platforms). This is an extreme activity at over 6500 feet in elevation. Our Ziplines range in length from 225′ to 650′ in lenth. 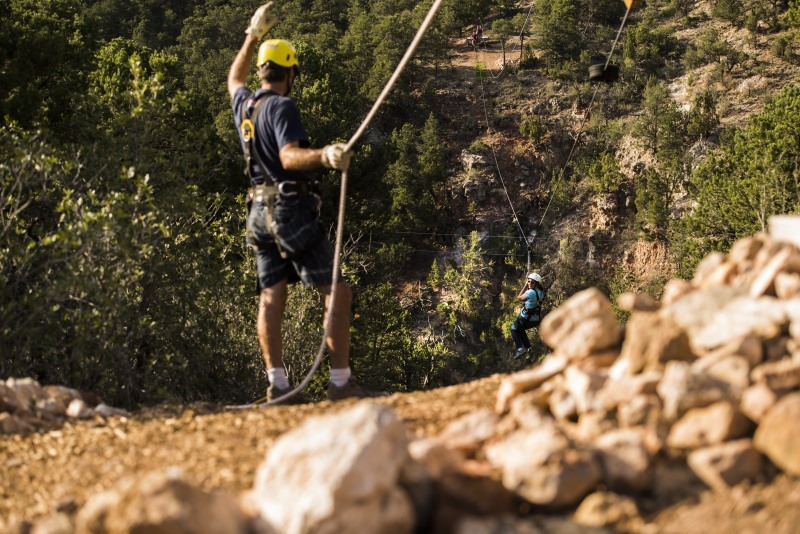 Our highest line is 100′ above the canyon floor. Don’t be fooled by other “Ziplines” consisting of glorified chairlifts and artificial platforms. Our tour is the real deal and you won’t be disappointed! Silver Surfer! Fat and Sassy! Thumbs UP! Superman! Spiderman, and many more like, The Bike Rider, The Crucifixion and The Tebow! Choose any of these or make up your own moves in this free style zip course! Our retail shop has awesome T=shirts and other souvenirs for your family and friends. Get a piece of Colorado! 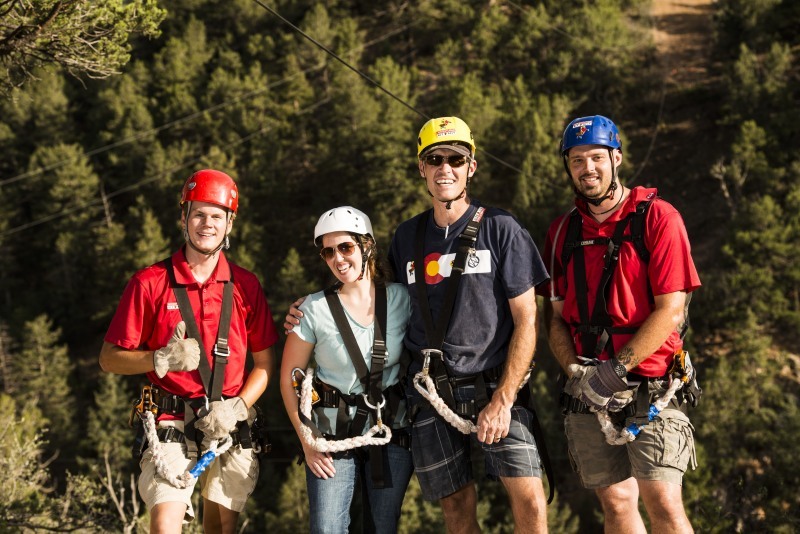 Our guides are extremely fun and work hard to provide a safe and fun ziplining experience. If you like your ride please tip your guide, 20% is common for this industry. They will thank you.